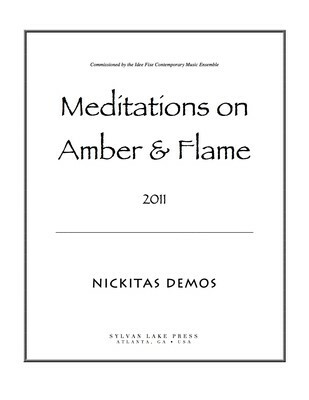 All scores/parts published by Sylvan Lake Press (ASCAP) unless otherwise noted. • Purchase individual parts as PDF downloads. 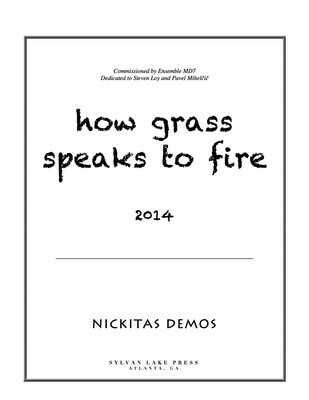 Note: When placing an order, you will be contacted via email by Nickitas Demos Website Store (orders@nickitasdemos.com). Please check spam filters to allow messages from this address. Thank you! 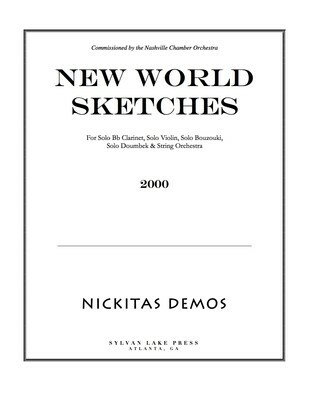 Mixed chamber work for Bb clarinet, violin, cello & piano. Single movement. Duration: 10 min. 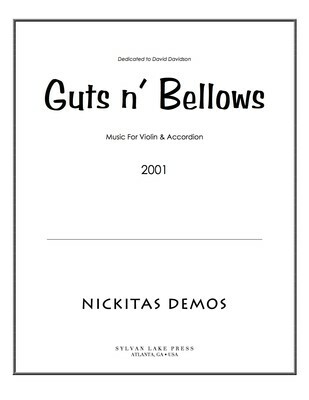 Duo for violin & accordion. Four movements. Duration: 12 min. 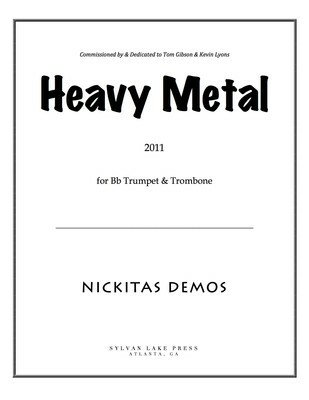 Duo for Bb trumpet & trombone. Single movement. Duration: 12 min. 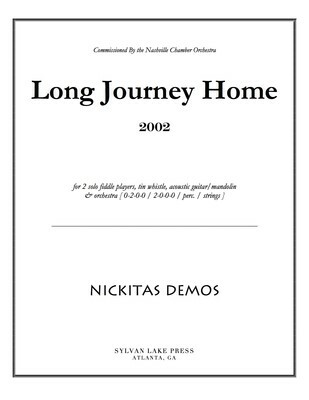 Mixed chamber work for flute, Bb clarinet, trombone, percussion, piano, viola & cello. Four movements. Duration: 18 min., 30 sec. 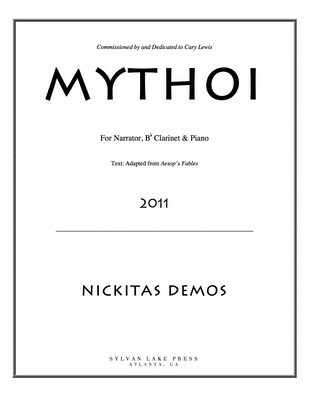 Mixed chamber work for flute (dbl. piccolo), bass flute, Bb clarinet & vibraphone (dbl. marimba). Single movement. 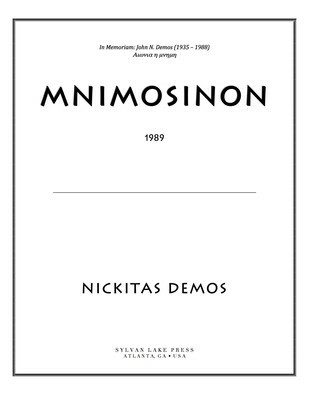 Duration: 9 min., 30 sec. 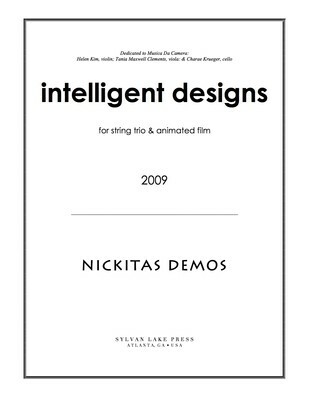 Trio for violin, viola, cello & (optional) animated film. Single movement. Duration: 11 min. 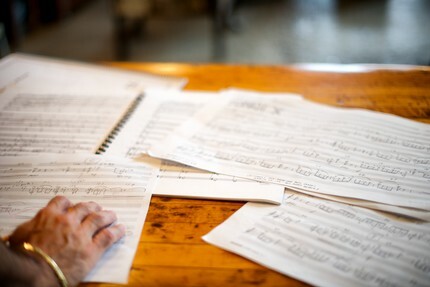 Vocal chamber work for baritone, clarinet, violin, cello, & piano. Single movement. Duration: 12 min. 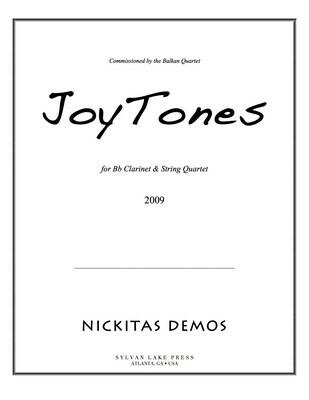 For Bb clarinet & string quartet. Single movement. Duration: 9 min. 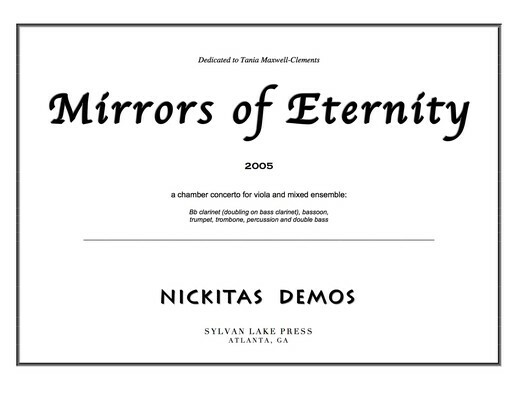 (Also available in a string quartet only version). Double concerto for Celtic fiddle, Bluegrass fiddle & orchestra: [1-2-0-0/2-0-0-0/1 perc./strings]. Three movements. Duration: 21 min. Double concerto for Bb clarinet, electric guitar & symphonic band. Three movements. Duration: 18 min. 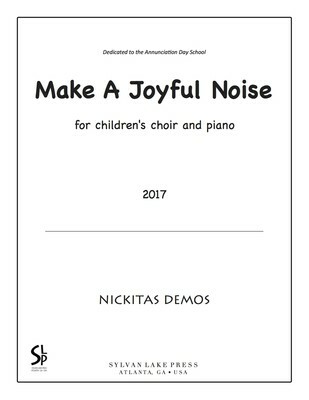 For children's choir and piano. Single movement. Duration: 1 min., 30 seconds. 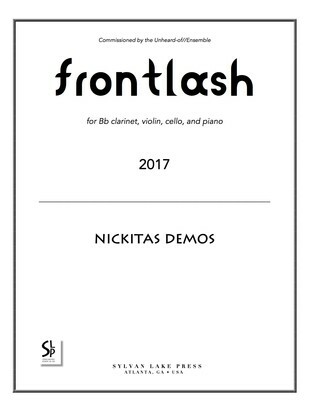 For Bb clarinet, violin, cello & piano. Four movements. Duration: 11 min., 30 sec. Chamber concerto for solo viola & chamber ensemble: Bb clarinet (doubles on bass clar. ), bassoon, C trumpet, trombone, percussion & double bass. Three movements. Duration: 25 min. 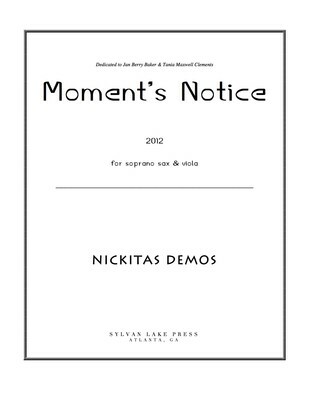 For clarinet, off-stage clarinet, cello, harp & percussion. Single movement. Duration: 11 min., 30 sec. 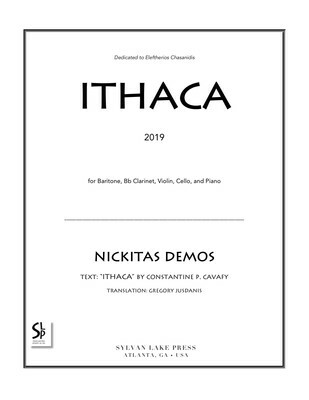 Duo for soprano sax & viola. Single movement. Duration: 7 min. 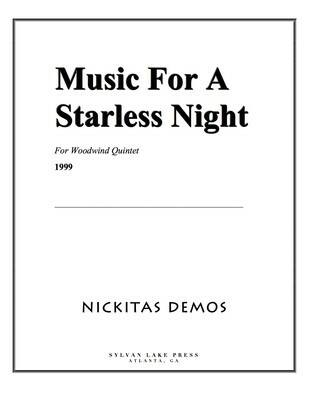 For woodwind quintet. Five movements. Duration: 19 min. 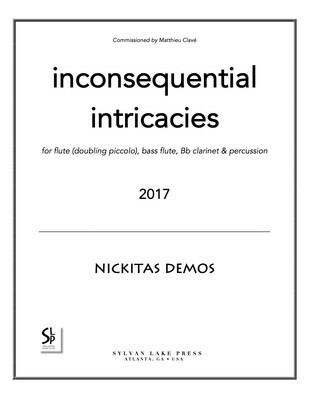 For narrator, Bb clarinet & piano. Five movements. Duration: 12 min. 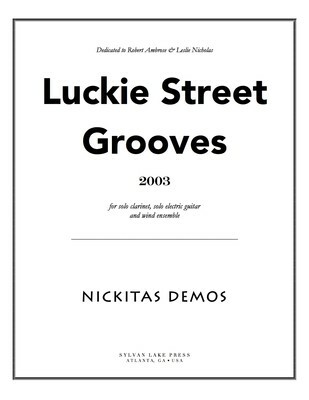 Concerto grosso for solo violin, solo Bb clarinet, solo bouzouki, solo doumbek and string orchestra. Four movements. Duration: 28 min.